The popularity of craft beer and microbreweries has exploded in recent years, and Israel is not missing out on the craze. Craft breweries, a trend which actually began in the 1980s, are marked by their independence, local character, smaller scale and brewing capacity. With beer aficionados acquiring increasingly refined tastes for craft beer, more and more of these boutique breweries are gaining market share from an industry once dominated by big commercial brands. Yet when most Israelis think of beer, big industry names come to mind like Goldstar or Carlsberg, and until about five years ago, these were the only options available. But today, Israel is joining the craft beer movement, with Alexander Brewery, the largest craft beer producer in the country, at the forefront of industry innovation. 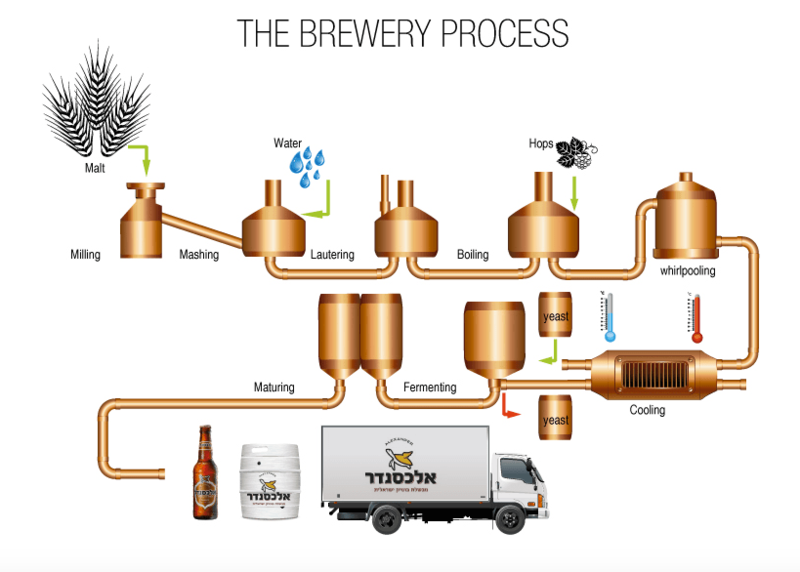 By combining eco-friendly processing techniques with top-of-the-line production, Alexander is quickly becoming the go-to brand for Israelis seeking craft beer. Founder and CEO of Alexander Brewery, Ori Sagy, a former fighter pilot in the IDF with a degree in beer-making (yes, that exists) tells NoCamels, “95 percent of the beer in the world is produced by industrial brands like Heineken and Budweiser. The goal of these industry beer producers is to make as much beer as they can at the lowest cost possible.” Sagy remarked that there is an upside to this, because it makes the beverage accessible to more people at a low cost, but he insists that craft beer will always be the preferred choice of real beer enthusiasts. The industrial process for producing craft beer differs from that of commercial brands, right down to the basic ingredients. “There are four main ingredients in beer,” Sagy explains. “Hops, malt, yeast, and water. Industrial beers use substitutes such as extracts, rice, cornstarch, and cane sugar to cut their ingredients. It’s cheaper and more stable, but a lot less flavorful.” Sagy points out that Alexander distinguishes itself by sticking to the four basic ingredients in their purest form, without resorting to extracts or additives. And the difference is clearly evident in the taste. Where other beers may have a slight metal or chemical aftertaste, Alexander beer has a smooth, rounded flavor, which Sagy attributes to Alexander’s water purification process and unadulterated, all natural ingredients. These days, the hipster fans of craft beer also have a passion for local, organic, and environmentally friendly companies. That being the case, Alexander Brewery is definitely the answer for the Israeli scene as it prides itself on its relationship to the environment. The brewery’s water is heated using solar power and it donates spent grains to local farmers free of charge to use as livestock feed. In addition, the company saves all of its process residuals from its beers and (this is a big hipster TA-DA) all its beers are 100 percent vegan. In fact, the company just launched and released the first certified organic beer in Israel this summer, in its popular “Blonde” flavor. Sagy explains that another unique aspect of Alexander is its invention and production of completely original beer flavors – all designed and perfected by Sagy himself. Alexander specializes in ale-type beers: Alexander Black, a seasonal beer for the winter with aromas of dark chocolate and espresso; Alexander Ambree, a reddish French-style ale; Alexander Blonde, a low-alcohol Belgian-style ale with a floral and fruity aroma; and Alexander Green, a hoppy IPA with an Israeli twist — a fruity aroma of grapefruit, guava and mango. For the premium craft beer, customers can expect to pay about $5.00 a beer, about 60 percent more than your run-of-the-mill industrial beer in Israel. Counting just three years on the market in Israel so far, this company has seen impressive growth, doubling sales in the past year alone. And the international beer community is taking note. Some accomplishments include winning the World Beer Cup this year in Denver, Colorado and the Gold European Beer Award last year. Now Alexander is setting its sights on international distribution, with hopes to expand to the United States and China. However, the biggest obstacle to making Alexander Beer a globally recognized craft beer name is the considerable Israeli excise tax for beer, which is ten times higher than that of the United States and other Western countries. In fact, more than half the cost of a bottle of Alexander Beer goes to taxes.